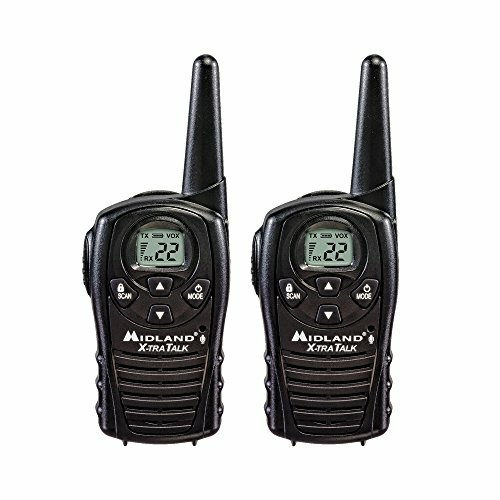 Gear up for the outdoors without sacrificing communication with the Midland LXT118 FRS Walkie Talkie. It is a water resistant, license-free radio that provides clear point-to-point communication, with superior reception, transmission, and sound quality. Connection to other FRS or GMRS two way radios is limitless as long as you connect to the same channels/frequencies. This two way radio has 22 channels with up to 18 miles of communication range. Maximum range can only be achieved through optimum conditions that include open rural areas without obstructions, flat areas where you can see the other person, and over water. Also be sure to use fresh or fully charged batteries to ensure you get maximum range. The LXT118 features Channel Scan that automatically checks channels for activity, Auto Squelch to remove annoying background noise, and 1 level of eVOX - Hands-Free Operation. This radio also features call alerts, easy button access, and a battery life extender. Midland's Dual Power Option allows the use of the rechargeable batteries (Not Included) or 3 AAA alkaline batteries (Not Included). In addition, the LXT118 has a 3-Year Warranty. Midland Radio will replace any faulty radios within 3 years of purchase. Included in the box: Radios (x2), belt clips (x2), and the owner’s manual. This radio provides an easy-to-use, low cost, and reliable solution to long-range communication for any outdoor enthusiast.